Ancient Ayurvedic science has multiple aspects and solutions for multiple disorders. For obesity treatment Ayurveda is panacea. As per Ayurvedic science, there are three principle life energies in the body; Vata, Pitta and Khapha. For a disorder in any of these body systems separate diets are required. A misbalance in Kapha causes obesity therefore appropriate diets are required to balance the Kapha energy. 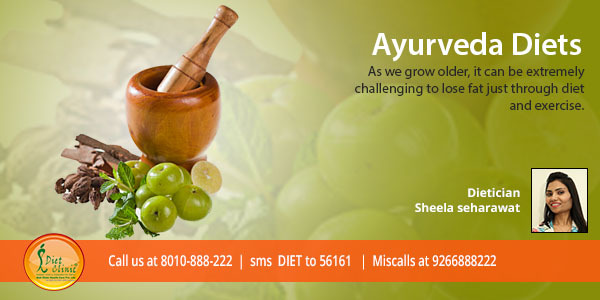 Dieticians at Diet Clinic have widely researched over Ayurveda and prepared Ayurvedic diets from the lap of nature. Diet ClinicÂ® is a program of regular follow-up visits/ telephonic/ contact during the diet plans phase of the program. Results may vary from patient to patient. Rapid weight loss may be associated with certain medical conditions and should only be considered by those who are medically appropriate. © Copyright 2018 Diet Clinic. | All Rights Reserved.